I wanted to take John out for dinner and it was a toss up between barbecue and seafood. The one place where you can find both, within close walking distance, is Steveston village so we ended up at the Hog Shack Cook House. 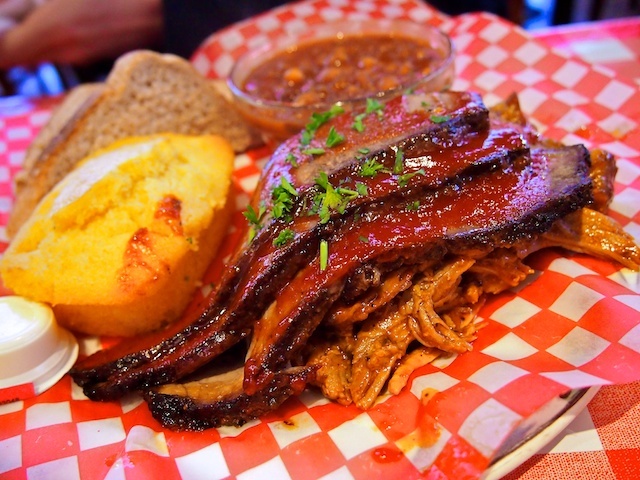 Located right on Bayview Street, the menu includes everything from Dinosaur Bones to grilled shrimp and pulled pork — although I heard through the Twitter grapevine that they serve up some killer burnt ends as well. Sitting on the red and white checkered table when we arrived was the beer list. I should have known to expect an amazing selection as there was a CAMRA sticker on the front door when we walked in… but I didn’t expect this. 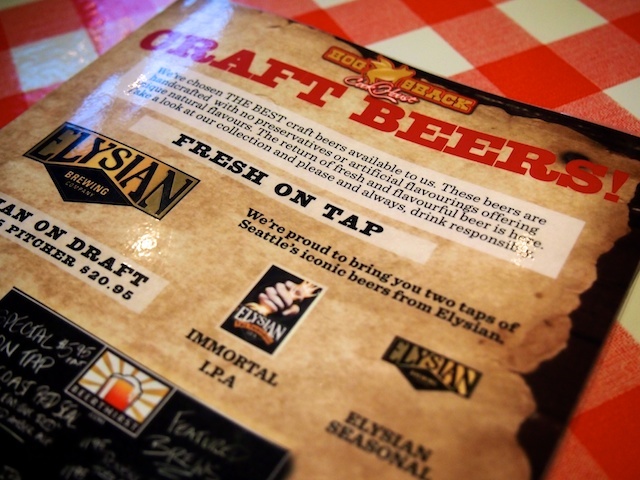 With a helpful guide to let you know how hoppy the brews are, well over two dozen craft beers were listed and sorted by category (lagers, stouts, IPAs and such). John immediately gravitated toward the most hop-filled beer he could find and once we posted where we were on Twitter, he received several other recommendations for his beer selection. We both ordered the Smoke Lover’s combo off the menu that came with brisket, pulled pork, Texas toast, and your choice of two sides. Sides ranged from coleslaw and fries to mashed potatoes and rice pilaf. I went slightly less traditional and got steamed veggies and potato wedges. John opted for baked beans and cornbread. He told me he wanted to compare the cornbread to Jimmy Jack’s, where we ate last month in Iowa City. The meal arrived very quickly and didn’t disappoint. My vegetables were crisp and fresh, and John said his baked beans were pretty stellar. The brisket and pulled pork were both tender and full of flavour. I dipped my potato wedges in some of the sauce that was on the table (not sure if I was supposed to) but that was pretty darn tasty as well. My portion was almost too much for me but I finished it all up save for one piece of Texas toast. We were very happy to finally get to the Hog Shack especially after hearing so much about it on Twitter. John knows his barbecue, having grown up in the Midwest and spent plenty of time in Kansas City, and he gave it his stamp of approval. Our bill came to $49 with HST, which isn’t too shabby for two beers and overflowing platters. The icing on the cake was the spectacular Steveston sunset over the river. I was not paid or given any other compensation to write this review. We paid for our meal. Been wondering about this place. Will have to check it out. Hubby and I love that place! Next time you’ll have to try their burnt ends – they are melt-in-your-mouth morsels of deliciousness. Just be sure to call ahead (or check them out on twitter) ahead of time to make sure they have them. I hope you tried the Immortal IPA! We sampled it at CAMRA’s Oktoberfest/Harvestfest last weekend and it’s hands down my favourite! 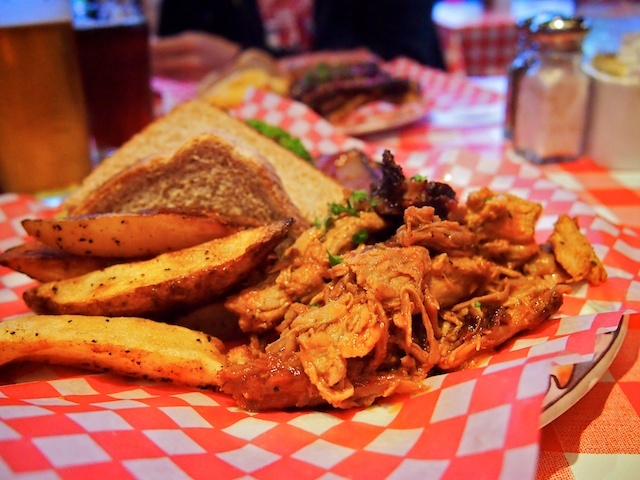 Can only imagine how good it would be with BBQ pork and corn bread….mmmm!